2012 Andhra Pradesh State Eligibility Test for Lectureship (AP SET) / State Level Eligibility Test (SLET) Examination Paper I conducted by Osmania University, Test Booklet Code (Set or Series) W (General or Compulsory for all subjects is given below. Often, as I (Nehru) wandered from meeting to meeting, I spoke to my audience of this India of ours, of Hindustan and of Bharata, the old Sanskrit name derived from the mythical founder of the race. Sometimes as I reached a gathering, a great roar of welcome would greet me: Bharat Mata Ki Jai – ‘Victory to Mother India’. I would ask them unexpectedly what they meant by that cry, who was this Bharat Mata, Mother India, whose victory they wanted? My question would amuse them and surprise them, and then, not knowing exactly what to answer they would look at each other and at me. I persisted in my questioning. At last a vigorous Jat, wedded to the soil from immemorial generations, would say that it was the dharti, the good earth of India, that they meant. What earth? Their particular village patch, or all the patches in the district or province, or in the whole of India? And so question and answer went on, till they would ask me impatiently to tell them all about it. I would endeavour to do so and explain that India was all this that they had thought, but it was much more. The mountains and the rivers of India, and the forests and the broad fields, which gave us food, were all dear to us, but what counted ultimately were the people of India, people like them and me, who were spread out all over this vast land. Bharat Mata, Mother India, was essentially these millions of people, and victory to her meant victory to these people. You are parts of this Bharat Mata, I told them, you are in a manner yourselves, Bharath Mata and as this idea slowly soaked into their brains, their eyes would light up as if they had made a great discovery. 16. Which part of Dharti gives us food? 18. What was the great discovery made by the villagers? 23. Some of the following constraints are faced by first generation learners in college and university. Identify them. 24. Who among the following distinguished scholars is considered as the father of communication science? 25. In a certain code CLOCK is KCOLC. How is STEPS written in the same code ? 27. The letters in the first set have certain relationship. On the basis of this relationship, make the right choice for the second set BF : GK : : LP : ? 30. If 5472 = 9, 6342 = 6 and 7584 = 6, what is 9236? 31. Five persons P, Q, R, S and T were travelling in a car. There were two ladies in the group. Of the three who knew car driving, one was a lady. There was one couple, of which only the wife could drive the car. P is brother of S. Q, wife of S, drove at the beginning. T drove at the end. Who was the other lady in the group? 32. All the students are boys. All boys are dancers. Which of the following inferences definitely follows from the above two statements? 34. Manisha is eleventh from either end of a row of girls. How many girls are there in that row? 36. There are 600 students in a college. 325 are boys and 275 are girls, each represented by a big circle, out of which 50 boys and 40 girls are from rural areas, represented by a small circle. 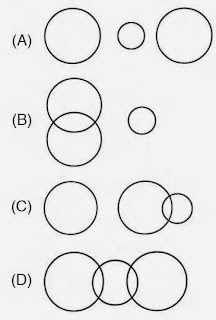 Which of the following diagram best represents the distribution in the college? 37. Which of the following sources of data can be classified as a primary source of data ? 40. Which of the following is not a measure of dispersion? 41. The Universe for a research study comprises of 60000 students from rural and urban colleges, boys and girls, students of various social groups. Identify the best method of sampling.